Beer may not be the first thing we think of when someone mentions Italy, but believe it or not, Italian craft beer is on the rise. I first read about this phenomenon in the New York Times and Saveur, but up until this past Sunday, I had yet to try any of the beers mentioned in those articles (I have had the My Antonia, which was a collaboration between Dogfish Head and Italy’s Birra del Borgo, but the version I had was brewed and bottled in the US, so I guess it doesn’t count as an Italian craft beer). While I have seen some of these beers in a few retailers, I’ve been hesitant to make a purchase, since they tend to be quite expensive (the Nora costs $17). A walk through Eataly during my recent weekend in Manhattan. They stocked an impressive array of Italian beers. Our friend Jim from the Beer & Whiskey Brothers blog also took a walk through Eataly and had this beer recommended to him by none other than Mr. Dogfish Head himself, Sam Calagione. Appearance: Made a loud hissing noise when I first opened it. Very loud pour, i.e. it bubbled and fizzed like crazy as I filled the glass, much like a bottle of Champagne or Asti Spumante. Fast rising, fluffy head which dissipates very slowly. Cloudy, pale orange color. Aroma: Ginger. Apple cider. Lemon zest. Flavor: Lots of carbonation. Very tart at first. Tasted like a Hard Apple Cider/Riesling/Saison mash-up. Dry, puckering, and long-lasting finish. 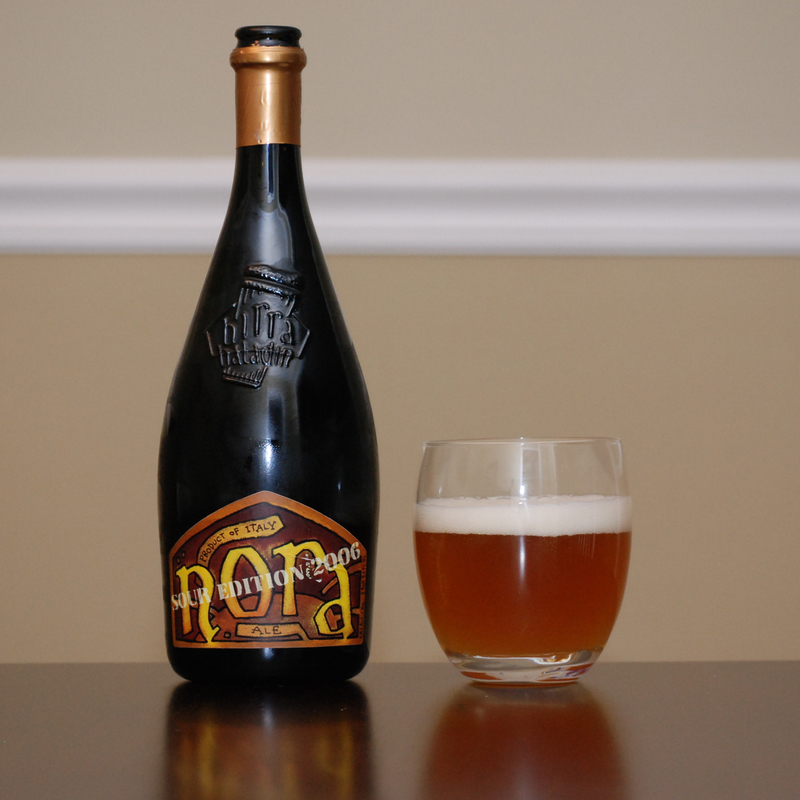 Much like the beers from Brasserie Dupont, the Birra Baladin Nora is one funky brew. It has a very crisp, dry palate that coats your mouth and doesn’t let go. I shared this bottle with The Alemonger and he thought that this beer would go really well with sushi. I’m thinking it would also go very well with tempura. Overall, I thought this was a really delicious and complex brew. The Birra Baladin Nora has definitely piqued my interest about Italy’s other craft beer offerings. I just wish they were less expensive! I feel like a proud first cousin of that review because I was there to witness the Hollywood magic and Lucas Arts digital mastery with which you made it appear as though the Baladin Nora was really there. I wasn’t sure how you were going to pull that off but it worked to perfection. Bellisimo! A wild brew to be sure. Reminded me of a very complex hard cider. Very effervescent, crisp and tart but with a lot of body towards the finish. At times it tasted like a richer version of a helles lager. Hard to put any one finger on what’s going on with this brew but easy to put them around around the glass and enjoy it. Hope to see it featured by Giada Delaurentis one day. Now if we could just get a comment or two from Giada. Sounds awesome! I’ve only had one beer from Italy, and it was at a massive tasting, so I didn’t get a good opportunity to dwell on it. All I know is that I really enjoyed it and that it was called Malthus Birolla and brewed by Il Birrificio di Como. It was a seriously complex beer. If only it were less expensive. It sounds like massive beer tastings are your specialty. The Alemonger is quite the massive beer tasting specialist as well. He did this Winter Ale tasting two winters ago that was way way over the top. Eight people, four rounds of beers, 5 or 6 beers per round. We did some serious damage! I realise this comment comes three years too late, but never mind. I’m originally from the Langhe region of Italy, where this beer originates from, and I’m happy you enjoyed it as much as you did. It’s nice to see local produce appreciated as far away as the US. Thanks for the comment! No such thing as too late. And while this beer may be expensive, that doesn’t mean I don’t recommend it or that I wouldn’t buy it again.